208 pages | 8 Color Illus. | 40 B/W Illus. By achieving a delicate balance between systems and practices, proper laboratory biosecurity reduces the risk of legitimate bioscience facilities becoming sources of pathogens and toxins for malicious use. Effective design and implementation of laboratory biosecurity depends on cooperation among individuals from diverse communities, including scientists, technicians, policy makers, security engineers, and law enforcement officials. Providing guidance to the broad international community, Laboratory Biosecurity Handbook addresses the objectives of biosecurity and the ways in which they overlap or conflict with those of biosafety. The book describes the risks of working with dangerous pathogens and toxins in the current era of international terrorism. The authors characterize the global spread of legitimate biotechnology and relate it to the rise of transnational terrorism, emphasizing the need for biosecurity measures even in legitimate bioscience. The book discusses biosecurity risk assessment-a practical methodology that allows laboratory management and biosafety/biosecurity officers to analyze and determine the level of risk, and serves as a basis for managing those risks. The book includes questionnaires that can assist the process of collecting data for a biosecurity vulnerability assessment, example standard operating procedures and memoranda of understanding, and other useful reference material. 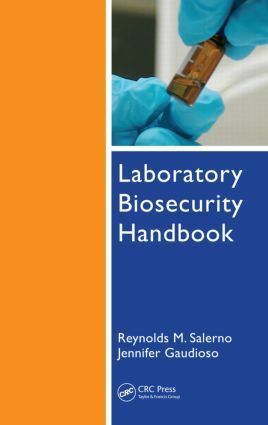 Addressing a variety of operating environments and the particular challenges they face when designing and implementing laboratory biosecurity, this book can assist bioscience facilities ranging from the large to the small, from those that focus on diagnosis or vaccine development, to those only minimally involved with infectious diseases. The detailed recommendations help avoid a "one-size-fits-all" approach to security and save limited resources. The book shows institutions how to develop and implement a biosecurity plan, and helps ensure that all components are included in the overall system, whether existing or new. "… I believe that this book contains quite valuable information useful for increasing the security of those bioscience facilities in which dangerous biological agents are kept. I was impressed by the wealth of important information he authors compiled in this book. Salerno and Gaudioso managed to prepare a concise handbook that is well structured and illustrated. Aside from the excellent explanations in the text, I was captured by the high-quality color illustrations … ." … this handbook should have a place in bioscience libraries and in offices of departmental chairpersons, laboratory supervisors, directors and managers, security officers and other bio-terrorism specialists in order to provide optimal access to the information … ." "In this text, the author’s state objective to attempt to begin documenting some of the methods and procedures for designing and implementing a laboratory biosecurity system is met and exceeded . . . The text is written in a logical manner using a detailed outline format for easy reading and reference. This book would be an excellent addition to any security director’s library, especially those employed at colleges, universities, hospitals and commercial entities that conduct biology-related research and development."